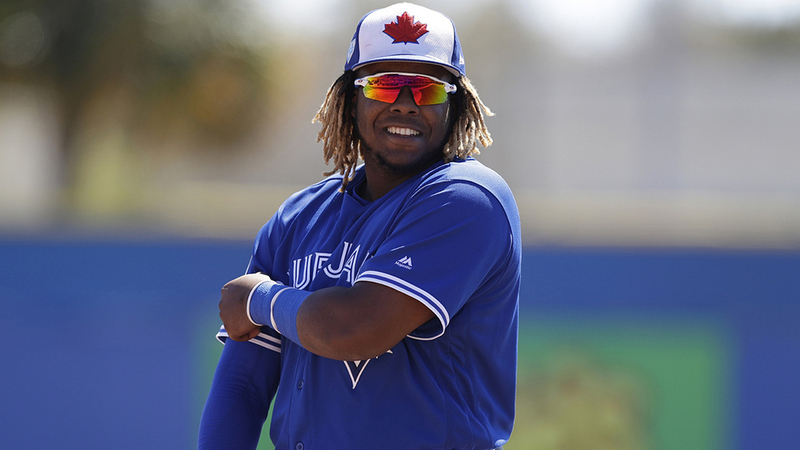 DUNEDIN, Florida -- In another world, Blue Jays third baseman Vladimir Guerrero Jr. would have been standing in front of reporters at Dunedin Stadium on Tuesday talking about how he's still building his Major League case. Instead, he had to discuss why that isn't happening -- at least not for a little while. MLB.com's top overall prospect expressed disappointment and understanding in how the Grade 1 left oblique strain he suffered in a Grapefruit League game last Friday will hold him back to begin the 2019 season. Guerrero is expected to be out for three weeks, keeping him from Major League camp and potentially holding him out for Opening Day with Triple-A Buffalo. He was officially designated to Minor League camp on Thursday. "It's things that happen," he said through a team translator. "If that's what the test said and that's what I need to do, then I just need to make sure I'm healthy and ready to come back. Injuries are a part of baseball, and I understand it like that. So I'll just be working hard to get back after Spring Training." Guerrero started at DH and batted fifth against the Pirates last Friday, going 0-for-4 with a walk. On Tuesday, he said it wasn't until the final at-bat -- a groundball double play to the second baseman -- that he felt the issue and reported it to the staff. "I felt a little discomfort, but I didn't think much of it so after the game I went and talked with [trainer Nikki Huffman], and so I didn't know how serious it was," Guerrero said. "It's not that serious, but I'd never had that injury before. After the tests, they told me, and that's it." That three-week timeline means Guerrero could be back to full speed by March 29. Minor League Opening Day is six days later on April 4, meaning the right-handed slugger could comfortably be back in the Bisons lineup for first pitch next month. However, the team isn't about to push the game's most exciting prospect in recent memory and risk further damage. "Those injuries, if you rush them, then you make it worse," said Blue Jays manager Charlie Montoyo. "Then, you lose three more weeks after that or a month. So we want him to show he's healthy before he starts playing, like 100 percent before he starts doing whatever." Guerrero, who turns 20 on March 16, remains on the cusp of the Major Leagues because of his impressive hit and power tools. The Dominican Republic native hit .381/.437/.636 with 20 home runs and a 38/37 K/BB ratio over 95 games across four levels last season. He made up for lost time (due to a knee injury) in the Arizona Fall League, where he produced a .351/.409/.442 line over 19 games. He was 4-for-19 (.211) with two doubles in six games this spring before suffering the oblique strain. Though the injury may have delayed Guerrero's push for The Show, he is preparing to do everything he can to make it look like just a small hurdle in his race to become this year's most accomplished rookie. "It's been going good," Guerrero said of his spring, "and now my mind is just going on getting ready as soon as possible and staying healthy so I can come back to play."